Once you drop to the bottom of the mooring, head to the north-west along the gutter. Do not spend too much time here now as you can do this on the way back. At the end of the gutter, veer to the north and you will see a lot of boulders. In this area the bottom runs from about 15 to 25 or even 30 metres much further out. Depending on the current, this may be as far as you can go. I would recommend going as far as the ridge that runs from higher up to your right and drops away to the left. Go to the edge of this ridge and you will be able to see into the gutter that leads up to the Shallow Entrance. This gutter can often contain grey nurse sharks, especially when there is little current around the island. You should be able to see them from the ridge. If there is a bit of a current, you will need to stop back near the boulders. 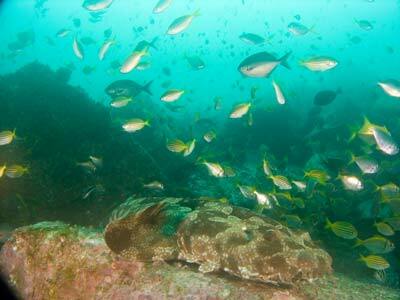 These are normally home to lots of wobbegong sharks. Be careful when stopping, as you may upset one (I did in April 2010 and it tried to ram me a number of times). When the current is running, this area is totally alive with fish. Hold onto part of the boulder and try to stay in the same spot. 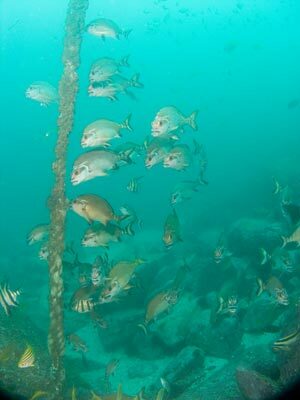 You will see silver sweep, yellowtail, ladder-finned pomfret, rainbow runners and more in their thousands. There are also huge numbers of red morwong, some may be hanging in behind the couple of old mooring lines that are still here. If the current is really strong, you may not be able to get far or perhaps stay long. At times, you will find that the barnacles that cover the rocks (and which you are holding onto) will break and you will be swept back. Try to grap another rock if you can. You want to spend at least 10 minutes here and perferably 15 to 20 minutes. Move around a bit if you can. Once you have been here a while, head to the east up the slope. If you look ahead, you will see a sort of gap between some higher rocks. There is also an entrance from a bit further north. As you approach, you will see that ahead there is a sort of bowl or hole. This is the Turtle Hole. The hole is about five metres across and perhaps ten metres long (it actually extends further but gets very narrow). The bottom of the hole is covered in broken barnacle shells. This spot gets its name from the fact that Napoleon the Turtle lived here for well over 30 years. 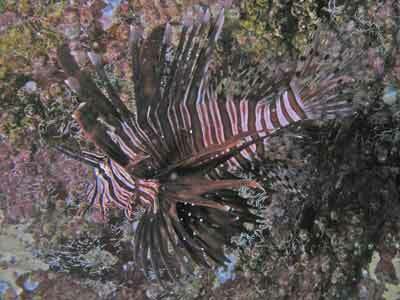 Noel Hitchins, the late owner of South West Rocks Dive Centre, used to hand feed Napoleon every dive he did he. As soon as Noel approached, Napoleon used to come up out of the bottom and approach Noel. He knew what was about to happen. Noel would pick up a broken piece of cunjevoi and cut it open and offer it to Napoleon. Napoleon would eat the cunjevoi from Noel's hand. Unfortunately, a few years before Noel's death in 2005, Napoleon disappeared, never to be seen again. In the turtle hole there are sometimes some very interesting things to see. 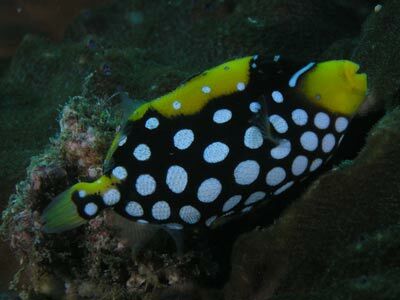 In April 2010 there was a baby clown triggerfish. This was about 75 mm long and so cute. 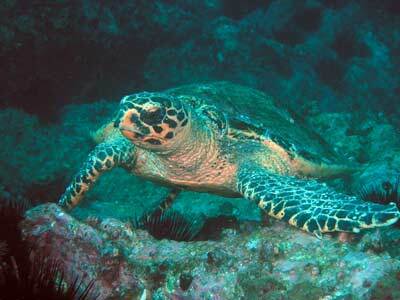 It would hang about the western wall of the hole, darting at times into a hole in a piece of plate coral to hide. It is the smallest clown triggerfish I have ever seen. Brilliant! There are also normally a lot of firefish in the Turtle Hole. They tend to hang around the walls. In the north-western corner of the hole there is a small crack that extends only 250 mm or so. It is not very wide, but what it contains is very interesting. The first thing you will see are urchins, but then banded coral shrimp. However, these are not the best things. If you look carefully, you will see some clear shimp. These are probably postoniine shrimp. They are also known as commensal shrimp, meaning that they have a commensal or symbiotic relationship with some other animal. You will normally find that where ever this other animal is found, you will find the postoniine shrimp. In the case of the postoniine shrimp here, they seem to be in a relationship with a strange, worm-like creature. The worm-like creature is in fact, a pipefish. 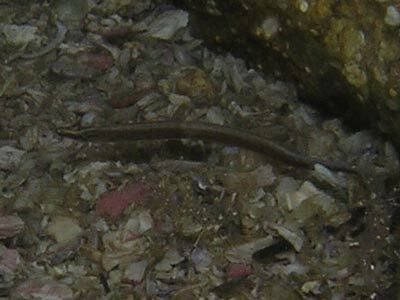 This is Maroubra perserrata, the saw tooth pipefish. They are very small, only 75 mm long at the most. They really do look like a worm until you photograph them and look at them later. There were at least three here in April 2010. From here, head back over the exit to the west and then follow the wall to the south. This then loops to the east. You will go over a rocky bottom, with some small rocks and larger boulders. This leads back to the Main Gutter. On the way you may see turtles on the wall. Soon the Main Gutter will appear and you may start to see some grey nurse sharks. Depending on the mooring your boat is on (remember, there may have been an arrangement to move from the one you started from), look for it as you swim along the gutter. 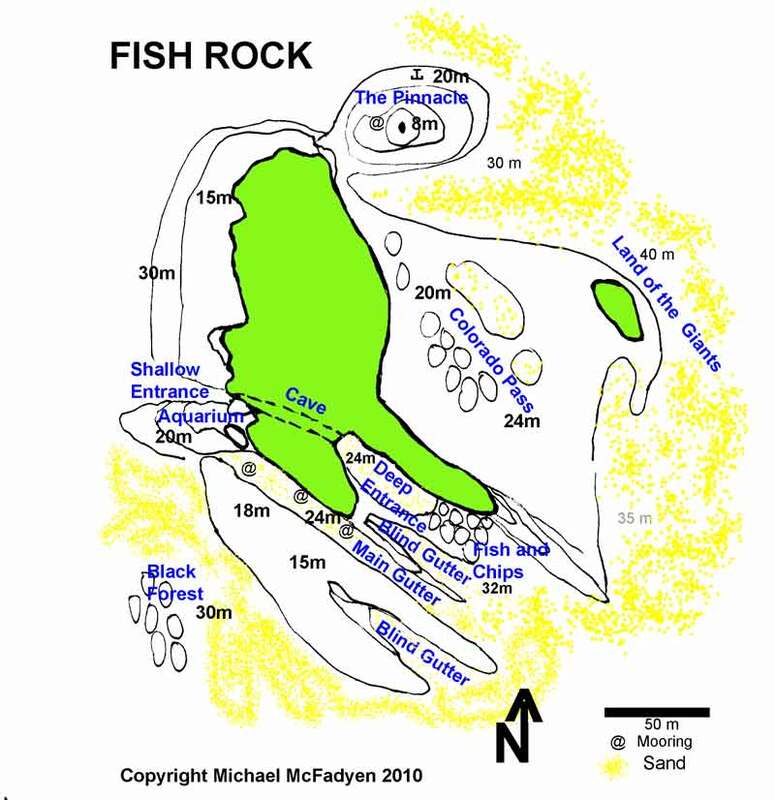 Finish your dive by doing your safety stop on the wall of Fish Rock and then swim back across to the boat. You can get an hour bottom time here, but you need to make sure you do not spend too much time at The Aquarium and then stay higher on the way back. A brilliant dive! Well worth doing time and time again.